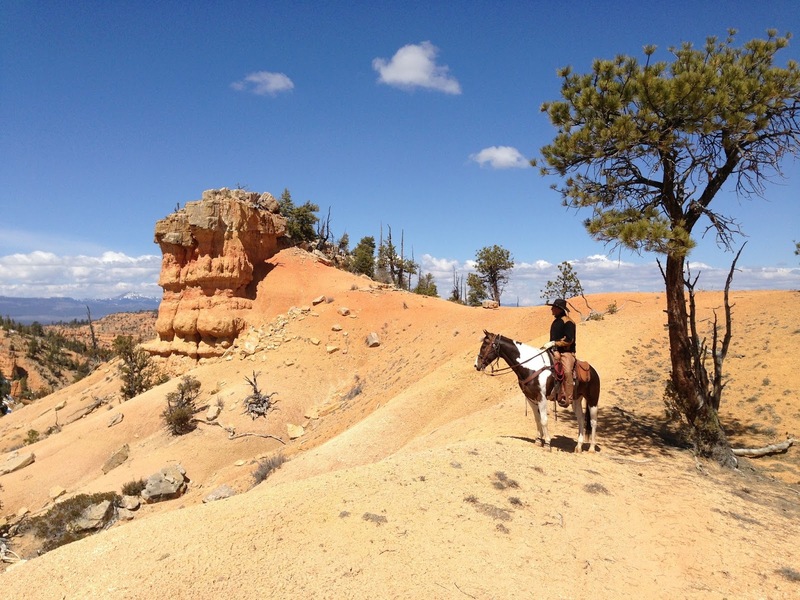 Camping and Horses : PLANNING A TRIP SOUTH THIS WINTER WITH YOUR HORSES? 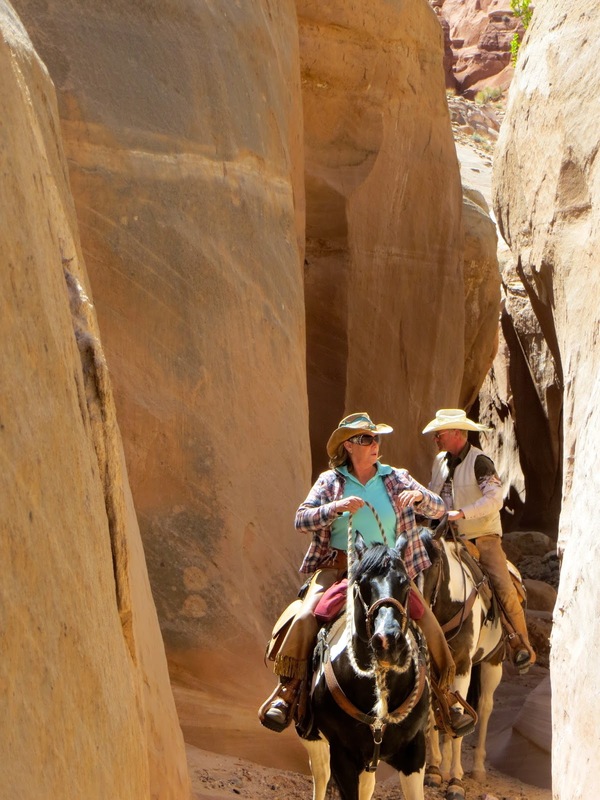 ARE YOU PLANNING A CAMPING TRIP SOUTH WITH YOUR HORSES THIS WINTER. Getting ready to travel long distance with live animals is not always and easy task. If your like us and you are planning on leaving Canada or some where from the north. You are traveling all the way to the southern U.S.A to find some warmer weather to ride and camp. There is a lot of planning before you hit the road. Is you truck and trailer ready to go?? 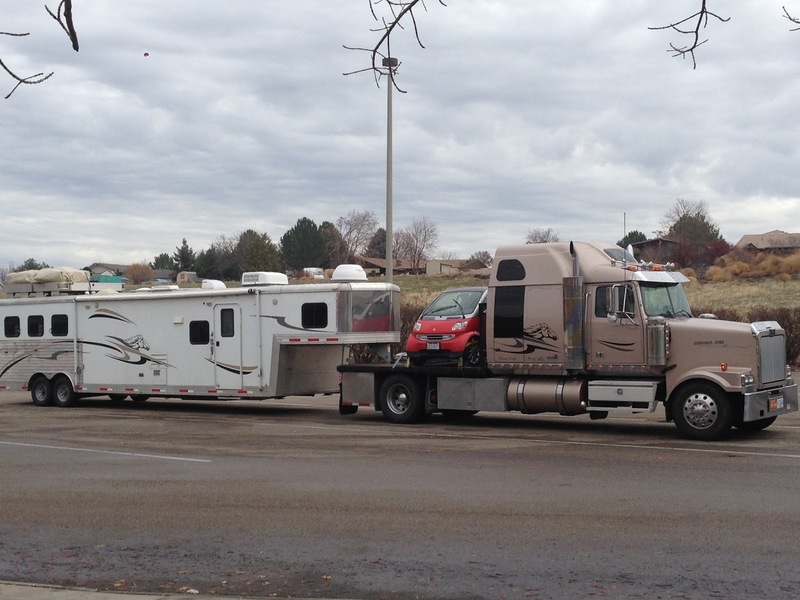 Here is a link to a "check list" of what you should do before leaving home with your truck and trailer. Are your tires in good shape?? Not only good shape but not older tires. 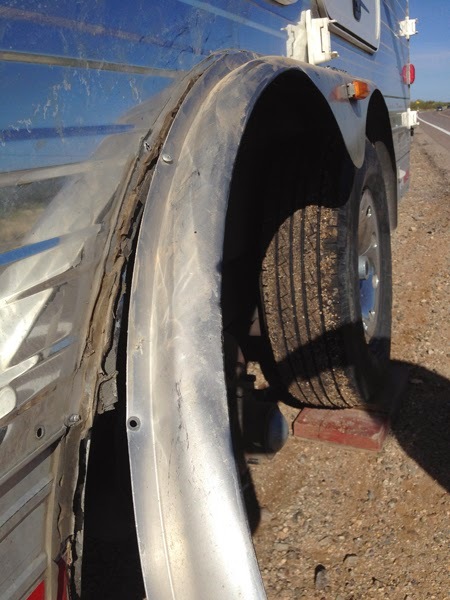 even the tires with good tread can still pop if they are older tires and have been sitting for any length of time. These pictures below where of tires no more then 3 years old. 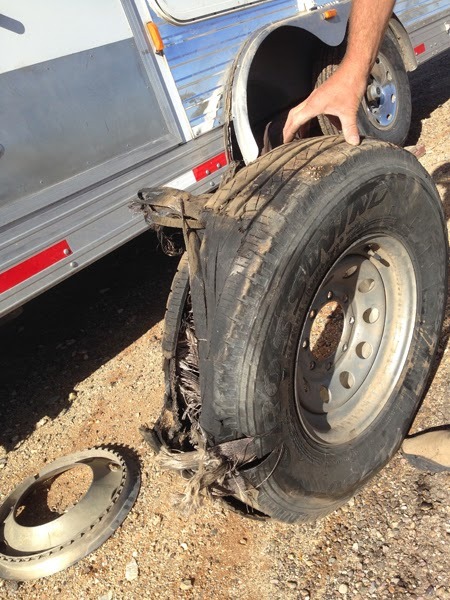 When this tire blow on us it took the fender and part of our storage area out. We where on our way to Catalina State Park in Arizona and had amost no where to pull over. So make sure you have a road kit with highway cones or road flares. Are you crossing international boarders?? If so you need not only a Coggins test but an international health certificate. If you are only traveling state to state you still need Coggins and health certificates. Your horse should also have up to date shots and worming as most facility want to see up to date medical records. Most of the US would also like to see brand inspections or proof of ownership papers. I always carry a copy of our horses registration papers. I find it easy to keep all my paperwork in one big binder. I put all my horses health and registration paperwork together so it is easy to find. If you are crossing a international boarder like we do then make an appointment to meet the Vet at the boarder with all your paperwork ready to go. Depending on what time you enter into the U.S.A plan you day and where you plan on stopping at the end of the day. I never make prior arrangements I have a binder that I have pooled all my info on overnight stabling into. Before you hit the road know your route and where along the way you can stop with your horses overnight. I call for stabling about an hour out from where we are planning on stopping. In some states there are also rest areas with horse corrals. Here are some good websites to copy info from for your binder. Also google all rodeo grounds on route and get their numbers and addresses. Try and keep in mind the rest areas you know have corrals. If you have cell or wifi well driving you can ask on my Facebook group if there is any over night stops close to where you are traveling. There are almost 16,000 people on this group and they always seems to be someone quick to answer any questions. SHOULD MY HORSES TRAVEL WITH HAY NETS?? I never put hay nets in the trailer. Our first trip down we meet a couple traveling from Washington to Arizona. We traveled from Oregon to California with them. When we got to our California stop their one horse had got his foot hang up in the hay net by pawing high up. He rode most of the trip on 3 legs and had a very bad bow in his front leg. If I give our horses hay it is loose in the mangers and I add a little water to it to keep the dust down and also to give water to those horses that do not like to drink on route. Check you horses every stop make sure they are not too stressed and are standing on all 4 legs. Offer them water at every stop. Make sure that the horses also have a good layer of bedding to absorb all pee so they do not slip well traveling. IS YOUR TRUCK BIG ENOUGH TO PULL YOUR TRAILER?? When we travel we travel with a huge trailer. 16' short wall with a 12' slide 3 horse. We have 2 horses about 21 bales of hay and a Smart car so yes we pull it with a Semi. Not all of you may need quite this big of a rig but if you do have a rig this size make sure you have the right truck to do the job. You must carry chains not only for your truck but also your trailer. If the snow gets bad then stop and wait do not risk your lives and you animals to try and get to where you are going faster. Think safety first. If you have to pull into a parking lot for the night. The horses will not die in the trailer over night. Before you leave watch the weather. If you can see 4 or 5 good days then that is the best time to travel. We will never make a exact date to travel. We travel when the weather tells us too. If the weather is not good the day you hope to leave then wait until it is. You must sign up in Canada before you leave and get you Sim card. You can not get this deal after you enter the US if you are Canada. Order a head of time. For under $50 a month US you get everything you need in a phone and wifi cover. If you need to up load large data go to Starbucks, or MacDonalds they always seem to have free wifi. Here is a link for Roam Mobility for you Canadian's traveling down south. REMEMBER !! Sign up before you leave CANADA!! WHAT ELSE DO I NEED TO TAKE?? Here is another great "checklist"!! Both the checklists I have given links to on this page are printable so add them to your binders. That of course would depend on where you are leaving from? Great destinations in the winter. We of course love Arizona. Would love to hear about your travels so please join our Facebook page and share camping stories and pictures of hitting the trails with your horses. HAPPY TRAILS AND MAYBE WE WILL SEE YOU DOWN SOUTH! 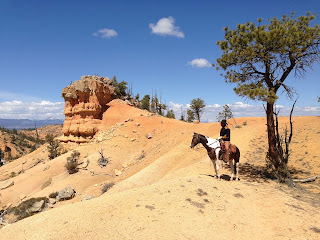 Nice post about "PLANNING A TRIP SOUTH THIS WINTER WITH YOUR HORSES?" Gambling games that you can play every day. viva3388 Online casino site to play gambling all the time. With the selected gambling. There are a lot of bets to play. No matter where you play, where to gamble. I came to play it. Give more return. Complete with various online gambling. The higher the profit, the more comfortable the game, the more you can play it.